The Dogbane is just starting to bloom. The botanical name is Amsonia tabernaemontana 'Blue Star', also called Blue Dogbane. It's a nice perennial, one of the few "true blues". The picture doesn't really show how blue it really is. 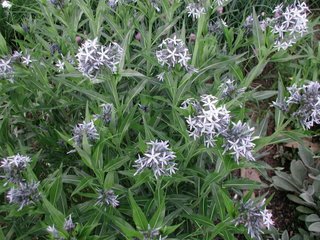 This perennial gives me no trouble and has been reliably blooming for several years now. I recommend it! I did some major pruning on my serviceberry tree. Serviceberry can be grown as a small single-trunk tree or as an overly large multi-trunked shrub. I bought mine as a tree, but then let a lot of suckers come up, so it was trying to be both. I made the decision to take it back to a single trunked tree. I think it looks better this way, plus it isn't crowding out the gate that is next to it. Check out My Garden Pictures for some pictures of purple flowers in my garden today.